The Chestnut Ridge Pole Barn has two stalls, a big alley and a shady grooming area on run-in on the side. The versatile 10'x24' overhead shelter also makes a fine carport or equipment shed. 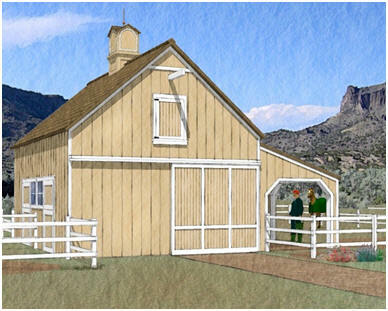 Floor Area: 480 Sq.Ft., Shelter Area: 120 Sq.Ft., Loft Area: 480 Sq.Ft.